Segregation at Eminem looks like this, according to Marlena May Katene. 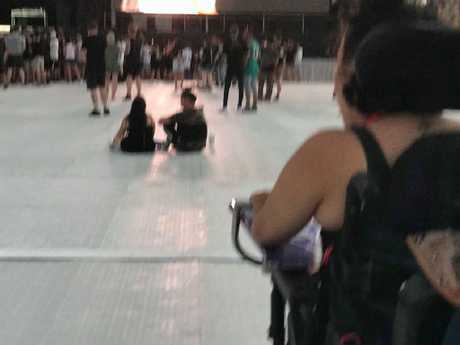 A Gold Coast disability advocate has accused "aggressive" security staff at Eminem's Brisbane concert of ignoring her VIP tickets and relegating her to the back row because she was in a wheelchair. 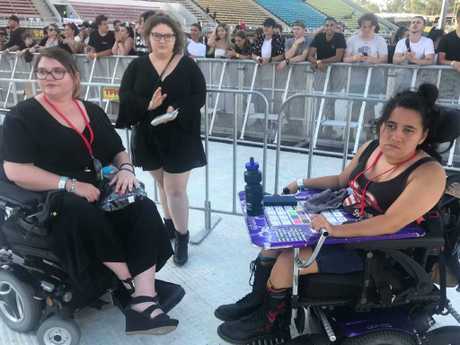 Music journalist Marlena Katene, 27, who has cerebral palsy, arrived early with her carer Bert Hibbert to get a spot in the standing area at Queensland Sport and Athletics Centre on Wednesday night. 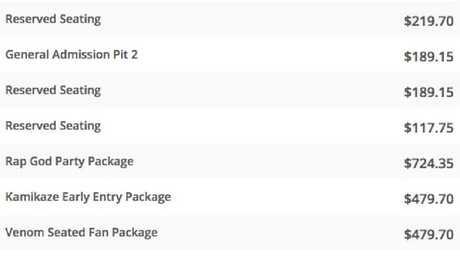 The Rapture 2019 VIP package offers fans early entry so they can "get the best position in front of the stage". 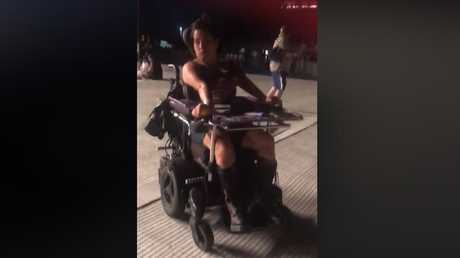 But as Ms Katene geared up to see the rapper open his four-show Australian tour, security deemed her wheelchair a "safety risk" and her group was forced to move to the back, according to her. 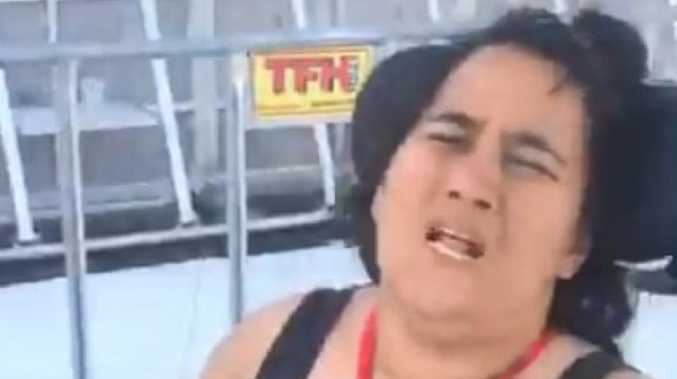 An outraged Ms Katene posted a video of the incident on her Facebook page, alleging that security staff had manhandled her carer. She captioned the live video: "This is what segregation at Eminem looks like". "This has got to stop," Ms Katene wrote. "When we look at the royal commission space this week, this highlights why removing people with disability to spaces is wrong." Ms Katene said she and her friends had acted calmly and respectfully. "Security once again have lied, saying we threatened, swore and were aggressive. Couldn't be further from the truth." Security are “now watching” Marlena at the concert, according to her Facebook post. Ms Katene joked that her carer's dancing proved more of a safety risk than her wheelchair. Ms Katene is non-verbal but spoke to news.com.au from the concert through Mr Hibbert who said security had "not allowed (her) to mix". Mr Hibbert claimed security pushed him and walked him out when he argued that the group should be able to stay in the area. "They kept shifting the blame and then security came over started pushing, literally," he told news.com.au. "They walked me out, but couldn't get Marlena's chair to move. "They were in process of getting police involved and were physically aggressive and accused myself of the same. "I stood my ground and did not swear once. "This is a common thing happening lately ... Basically we did not get what the ticket says we can." The group did not get the experience they were hoping for. Marlena Katene and friend Maya (left). He said Ms Katene was just trying to have fun, but the actions of security "destroys what typically would have been an awesome night out". Mr Hibbert said the promoter and security usually passed the buck and didn't take responsibility. "Ultimately I believe the onus is on the venue - they choose to sell packages, they can't say one part of society can't access that." 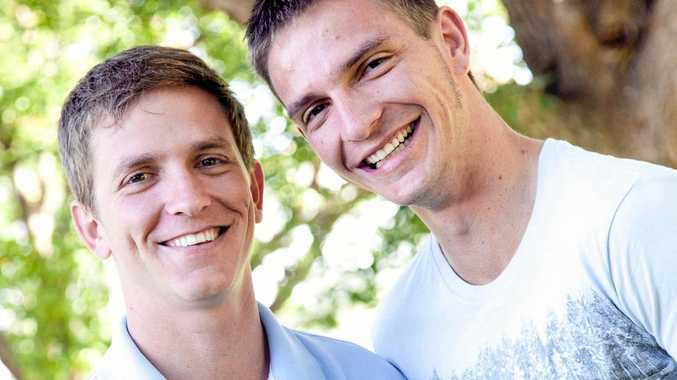 They were later allowed to move to an area where they felt they could interact with other concertgoers and have a good time by 'sticking to our guns'." "We still have been denied the opportunity to chat and mix with people. Typically we would have a group of new-found friends dancing and having a good time. It's the first time in four hours we had someone engage with us from the public just now." Supporters of Ms Katene expressed their outrage on social media, with one saying: "That's terrible. You guys should be in front of the stage, not in a cage. Especially if you are paying premium." Anoter said: "It's so bloody wrong. $500 tickets to sit at the back? 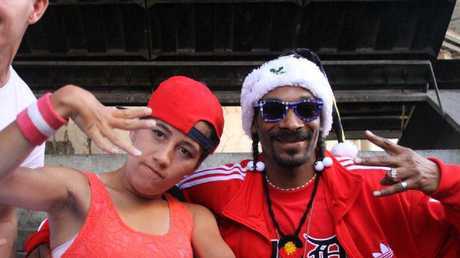 No way." Ms Katene's said was security was "nothing but disgusting". "Teg Danity (the promoter) is okay, but still does not have a true idea of what inclusion actually is. The venue was average at best .... they actually agreed with our points." It's not the first time that Ms Katene has experienced this kind of issue. Last August, she said her carer was removed from a Pink concert after she was denied entry to a VIP area because of her wheelchair. The Queensland Sports and Athletic Centre and Teg Dainty have been approached for comment.